An emotionally supportive crystal, tanzanite is highly recommended when facing periods of prolonged stress and difficulty. It opens the Throat Chakra, and connects with and balances the Third Eye and Crown Chakras, bringing a synthesis of communication and psychic power. It can facilitate meditation, communication with the spiritual world and other-worldly planes, and astral travel. Tanzanite is very cheering, so also acts as a mood-lifter and anti-depressant. It has a distinctly feminine energy. It can aid healing in connective tissue, such as ligaments, when used directly on the body around the injured area. The energy is quite directional. In additional to the properties of blue-to-purple tanzanite, energetically, bi-coloured tanzanite is incredibly powerful, and not at all comfortable to work with – in fact, it is probably best used only by those with plenty of experience of working with crystals. Even then, you may find it takes a few attempts before you are able to attune to the energy of the crystal (and vice versa), and be able to work with it. However, it is well worth persevering. Bi-coloured tanzanite’s special gift is an alchemical transformation followed by balance. It burns off whatever isn’t needed from one’s life, allowing us to arise from the ashes into the next phase of our journey. After the conflagration, bi-coloured tanzanite brings balance of both male and female energy, and the heaven/earth connection, so higher work can be achieved while remaining grounded. It opens the Crown, Third Eye and Throat Chakras, unfurling our spiritual and psychic gifts like a flower, and anchoring them in the Heart and Solar Plexus. 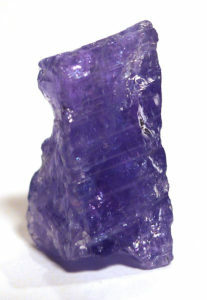 Bi-coloured tanzanite can also balance the chakras, and is particularly clearing for the Throat and Third Eye. From a different perspective, it can propel us forward at a great speed, making it a perfect crystal to stimulate enterprise and creativity. It also assists interdimensional travel, ‘taking’ you anywhere you desire to go. 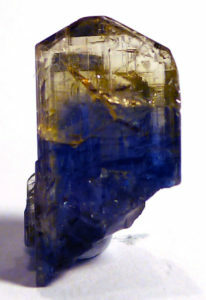 Tanzanite is a rare sapphire-blue to purple variety of zoisite. The colouration is due to the presence of vanadium. It is frequently heat-treated at between 400˚ and 500˚ C to remove brown or yellow patches and improve the colour – this does not affect the value of the mineral. Tanzanite displays distinct pleochroism, and will appear purple, blue or grey depending on the angle from which it is viewed; the faceter must therefore orient the stone carefully to get the best colour. Tanzanite is named after the East African state of Tanzania, where it was discovered, in the Mererani Hills of Northern Tanzania in 1967. There are no ancient traditions associated with this mineral.